A good-natured Tuhaakh, Gomekh works as a butcher and freelance blacksmith in the waytown of Hadu-Shad. Born into a rough rural family, Gomekh was often ridiculed as a child for his jutting malformed lower jaw and severe underbite, an unusual deformity among his race. Forced to develop a thick skin early on, he always hid his tender nature and put on a brutish persona around his peers, earning a fearsome reputation. When the Lukrhut Wars threw the Hajadim territories into turmoil, Gomekh was drafted into the army as a soldier. As a Tuhaakh (one of the few Imperial races large and strong enough to face Lukrhut in single combat) he was often sent to the front lines, and was deeply scarred by the battles he witnessed. After defeating a Lukrhut chief in a duel, Gomekh saved a city from invasion and was awarded high honors. Though he was offered the rank of Amir Tuman after the war, Gomekh refused and retired to civilian life. 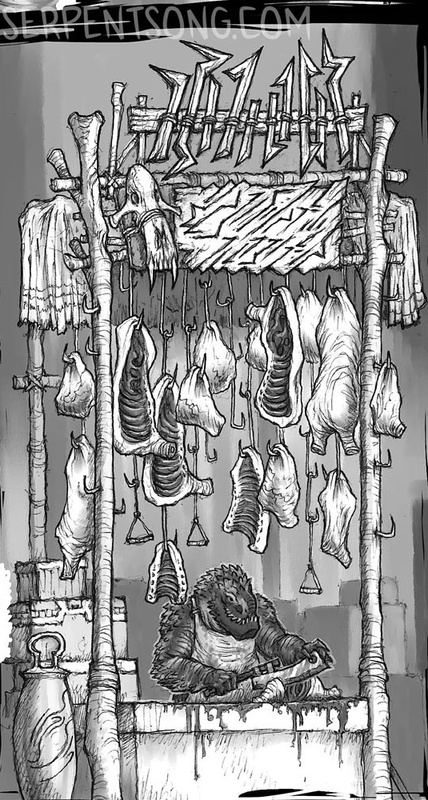 Gomekh set up a butcher shop in the waytown of Hadu-Shad, selling fine meats to travelers and residents of the walking city. In secret, however, he also works as a blacksmith forging weapons and armor for discreet customers. His skill at forging and crafting has made him legendary in certain circles, and he provides unique custom items to those who have the coin (and know how to ask). 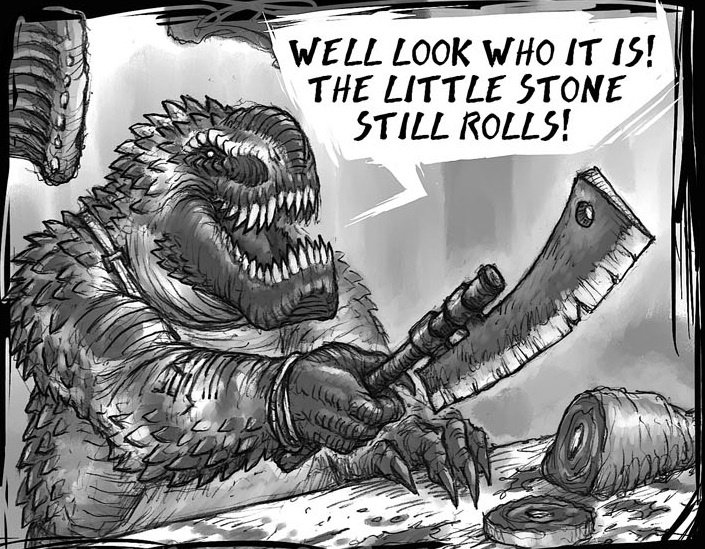 Despite his rough appearance and reputation among the Hajadim underground, Gomekh is a gentle soul at heart, and avoids violence whenever possible.